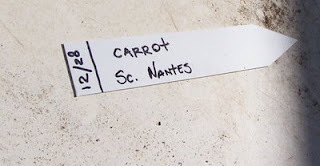 Please note how this seed label was written and duplicate the format for all your seed labels. Other information might be added as needed. For old seed, I can write the production year for the seed at the bottom of the label and I have abbreviations for the different seed houses I order from. Your name should always appear on the back!